How are feathered friends surviving the season? Ithaca, NY—How do birds withstand wicked winter weather and other daily threats to survival, even in warmer climates? A new environmental challenge from the Celebrate Urban Birds project at the Cornell Lab of Ornithology invites participants to show how birds are surviving in their neighborhoods this winter. It can be a photo, artwork, video, even a story or a poem describing how birds are finding the food, water, and shelter they need. People of all ages can participate as well as groups such as schools, libraries, clubs, and businesses. Celebrate Urban Birds is a free, year-round citizen-science project focused on birds in neighborhood settings. Prizes include a pair of Eagle Optics binoculars, bird feeders, a birdsong calendar, books, posters, cards and more. The first 50 entrants will receive a copy of the “Little Green Places” poster and selected images and videos will be posted on the Celebrate Urban Birds website. 1. Email entries to urbanbirds@cornell.edu . If you submit a video, post it on YouTube and send us the link. 2. Write “Survival_yourfirstname yourlastname yourstate” in the subject line. 4. 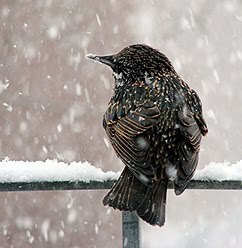 Explain why you submitted your entry—describe your winter conditions and what you observe the birds doing during winter. Visit the Celebrate Urban Birds website for more information, to see entries for past challenges, and to read the terms of agreement for all entries.